This is a Chinese name; the family name is Chin. 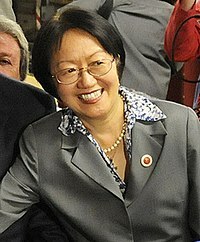 Margaret Chin (born May 26, 1954) is a Chinese-American politician. She is a council member for the 1st District of the New York City Council. A Democrat, she makes up the Asian American delegation of the city council. ↑ "Who We Are". Asian Americans for Equality. Archived from the original on 2009-08-03. Retrieved 2009-11-04. This page was last changed on 16 November 2018, at 19:00.